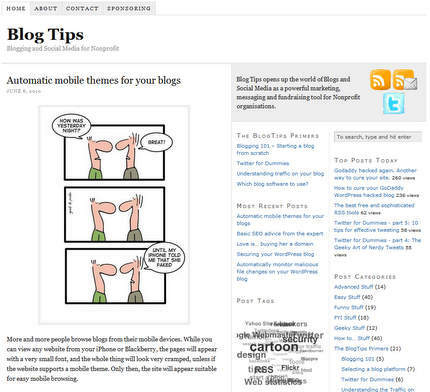 BlogTips, my blog for tips on social media and blogging for nonprofit causes, got a new look. Much more plain vanilla than the previous look, so it puts more emphasize on the content. Meanwhile, Humanitarian News continues to grow, so the site became slower and slower. That should be solved now (for the nerds: more aggressive caching was enabled on the site, and I avoided multiple DNS-lookups).